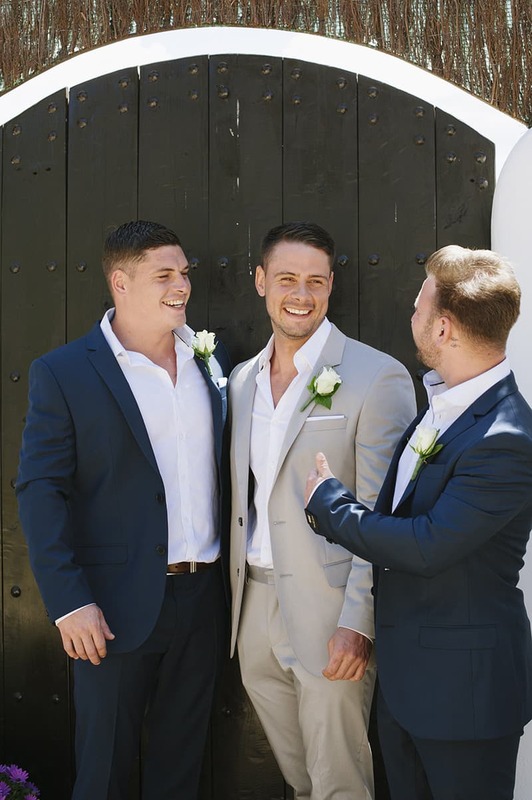 “Both myself and Chris agreed that we wanted a destination wedding and Ibiza was the obvious choice for us. We first met on the island nearly 5 years ago and have since returned on many occasions. We really wanted our family and friends to be part of our journey and for them to see what made us fall so in love with the island too! We visited to have a look at venues and instantly fell in love with Elixir Shore Club in Cala Codolar, the view took our breath away and the décor so modern and chic. We really wanted a soft romantic feel to our wedding and opted for ivory, soft peach and lots of pretty lace. Our wedding stationery was bespoke, designed by Something Kinda Cute in Wales. The stationery really captured exactly what we had wanted, a romantic lace inspired theme with a Spanish twist.We carried the theme throughout with our Amor table plan and let the love grow seed packets as favours. We wanted something small that our guests could take home and remember our special day by every time the forget me not flowered. The ceremony started at 3:30pm to avoid the heat, but just in case we also placed lace inspired fans on each chair for our guests to use during. We had a few DIY touches on the day, there were handcrafted wooden Amor letters on our dessert table and the day before the wedding I gathered my family and friends at our villa to make loads of pretty paper pompoms and help prepare the final touches. I had also really struggled to find a bracelet to go with my dress and with a little help from my bridesmaid and mum I handmade the one that I wore on the day. I have always wanted a lace fishtail dress and found my perfect dress at the Pronovias flagship store in New Bond Street, London – Spanish designer and perfect location to nip down the street for my Jimmy Choo’s too! I chose my favourite flowers to be used throughout the venue which included roses, peonies, hydrangeas and stunning David Austin roses which smelled so amazing! I was extremely lucky with the venue as the décor really spoke for itself with the chiavari lime wash chairs, romantic lighting and gorgeous chesterfields so it didn’t take much dressing at all. Chris chose a light grey cotton suit and crisp white shirt by Hugo Boss, cool and light perfect for the hot weather which he teamed with tan Ted Baker brogues. Finding the bridesmaid’s dress was extremely difficult! I visited various shops and internet sites in the search of finding one in the right shade of peach. In the end I decided to order a few dresses from the internet in the hope that I would get lucky, and I sure did! The dress was a steal at just £40 from missguided.com and was exactly what I had searched so hard to find! We decided to have Kids in Ibiza services on the day to help entertain the children, they made bracelets had face paintings and even got the kids to make us a personalised canvas to remember our special day, which was very sweet! When I began to research information on weddings in Ibiza, one of the first websites I came across was Ana Lui’s. Both me and Chris fell in love with her style of photography and before we had made any other decision about the wedding we knew we had to book her! Being in Ibiza the dance capital of the world it only seemed right to inject a bit of this into our day and we were very lucky to have Hed Kandi DJ Ben Santiago and Saxophonist ‘Lovely Laura’ to dance the night away with too. All of our vendors were extremely helpful, and Vickki the owner of Elixir Shore Club was always on hand to offer her expertise and experience. If I could give one piece of advice to couples about to get married it would be to do your research, I researched every aspect of our day and it really paid off! Can you imagine spending the night of your wedding, dancing away to the sounds of Ibiza’s iconic sounds of Hed Kandi? That would honestly be my dream wedding! And those peach and cream tones were just beautiful! Get me on the next plane to Ibiza NOW! I feel a somewhat disappointed that your lovely presentation did not include the focal point of the whole day!The Ceremony! Without question its whole purpose! Not one photograph of any part of it, and I know Ana took many during the ceremony. As the celebrant host, I know Chris and Kirsty loved the ceremony, thanking me profusely, as did many of the guests. Many were the compliments I received. It would be nice if you could credit me as celebrant. I am very sorry that you were not credited in our description. We are more than happy to credit where it is due so we will do that immediately. Congratulations on such a beautiful ceremony! Thank you. That’s great! Sadly my website is down at the moment – the hosting server was attacked by a hacker. It will be back up in a day or so. Thanks again, and well done for such a beautiful feature. I think Ibiza is the best place for a wedding 🙂 Amazing weather and stunning views! I visit it every summer, I rent an apartment and I enjoy visiting the island and relaxing. It is a beautiful place! Loved this post Emily. Have you any idea who the flowers are by? That bouquet is exactly what I am looking for for my Ibiza wedding! Love the blog! I am considering getting married in Ibiza as myself and my Fiance are both into our house and dance seen and it just seems right for our big day. I have found Elixir whilst researching and it looks great. Can I ask how many guest did you have and did you have them all stay in one location? I would love my guest to have exclusive hire of somewhere so we can all party together! Also what month did you marry in and did you find Elixir really helpful? Ibiza is such a beautiful destination to hold your wedding! There are just so many venues with gorgeous settings and views to die for, you really will be spoiled for choice. We had just over 30 guests mainly family and a few close friends and hired a 10 bedroom villa in Port Des Torrent called Casa Azul(which is only 5-10 minute drive from Elixir) for two weeks, which was amazing! I found the whole team at Elixir very helpful and the service on the day was second to none! We got married May 4th 2013 and the temperature was just right. You wont regret holding your wedding in Ibiza, nearly a year on a friends and family are still talking about it! Hello. I am getting married at elixr next year and would love to have as much info, advise or hints for us. So excited and it looks such an amazing place! I will ALWAYS be attracted to a beach wedding – and no wonder, this one is SO gorgeous! Beautiful light and gorgeous couple too. Love shooting at Elixir. The light is just beautiful. Great feature.